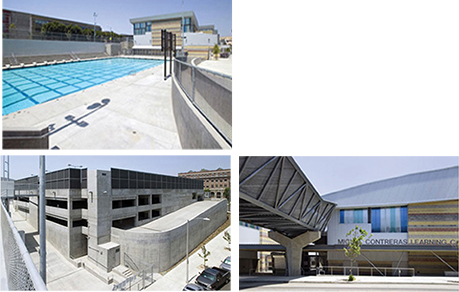 Structural Concrete construction for the new 72 classroom high school involving the redevelopment of 19 acres west of downtown Los Angeles to create a new 231,000 sq. ft. academic and athletic complex in seven buildings, varying in height from two to four stories, as well as a parking structure. Also included are a performing arts auditorium, a food court and a multi media library. In order to serve a number of area high schools, the program includes a special emphasis on its sport facilities, including two large gymnasiums, an Olympic-size swimming pool and a full-feature stadium.